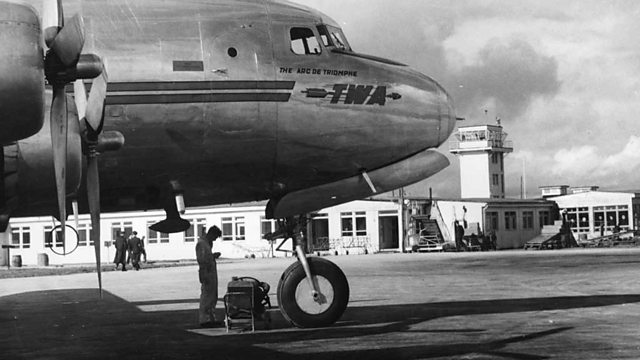 As air traffic control moves towards text messaging, Christine Finn toasts the voices of the air traffic controllers who have guided trans-Atlantic flights since 1919. Listening to archive of transatlantic flights from the first by Alcock and Brown in 1919, Christine discovered that the west coast of Ireland looms large in the history. She visited Shannon airport in County Clare, scene of many departures and reunions and - in the 1950s and 1960s - before the advent of the jet engine, a stop-over for most of the popular icons of the day as their planes re-fuelled after the 3000 mile flight. Every US president since JFK has visited Shannon and many of its classic stars from Marilyn Monroe to Fred Astaire.